While The Farm Bill has a huge impact on the CBD industry, unfortunately, it has little direct impact on the legal landscape of recreational and medicinal marijuana. The good news is all of the ways you can take advantage of CBD and the soon-to-be even more explosive market it makes up. No additional cuts to food stamps and nutritional assistance programs. One of the main reasons that the Farm Bill took so long to pass was controversy surrounding the various approaches to food stamps and the Supplemental Nutritional Assistance Program (SNAP). Negotiators of the Farm Bill have achieved a compromise that both strengthens SNAP and does not apply additional restrictions on food stamps. The addition of some farm subsidies, expanding some federal agricultural subsidies. This point is argued by some environmental groups, who say this expansion is wasteful as it would apply to extended family members of farmers that do not even work directly on the farm. No increase to the federal deficit as a result of it’s passing. Permanent (as opposed to previously temporary) funding for farmer’s markets and local food programs. Permanent funding for veteran and minority farmers. Preservation of a Conservation Stewardship Program, which incentivizes farmers to strengthen their own conservation efforts. And last, but certainly not least…legalizes hemp. Legalizes Hemp? Does that mean The Farm Bill legalizes marijuana? Contrary to much confusion since the passing of The Farm Bill, the bill does not federally legalize medicinal or recreational marijuana growth or distribution. Hemp is a part of the cannabis plant that has low levels of THC (under .3%). This means that not only can it not produce a psychoactive ‘high’ cannabis with higher levels of THC does, but it can also be used in a variety of ways you may have never expected. These are just some of the ways that industrialized hemp can make an impact with this newly passed Farm Bill. Have you noticed one way that didn’t make the list? That’s right, hemp can be used to produce CBD products. What is CBD and how does The Farm Bill impact the CBD industry? How does The Farm Bill impact the CBD industry? CBD’s full name is cannabidiol and it is derived from the oils of the hemp or cannabis plant. CBD is non-psychoactive meaning it does not produce a ‘high’ but studies have been shown that use of CBD is effective at reducing hard-to-treat or target pain as well as calming anxiety, whether it is diagnosed anxiety or just day-to-day unease. CBD is highly impacted by The Farm Bill passing because it allows for more hemp production and more dedicated research and development into the medical uses of the product. This bill is monumental for the hemp and CBD industries because, for the first time, The Controlled Substances Act of 1970 was amended concerning marijuana. The Controlled Substances Act stated that all marijuana-related products were classified as a Schedule I drug. On the last page of this 1000-page bill, that status of marijuana was changed to represent the legalization of hemp (again, no, this does not mean that marijuana was removed from the Act but its importance cannot be overlooked). While CBD has been legalized in all but 3 states, legalizing hemp production vastly opens doors for the availability of CBD containing products in a way that farmers and consumers haven’t seen since before the Controlled Substances Act was passed. This legalization allows for product development and research to expand in an extremely lucrative and exciting way. With demand for hemp and cannabis products only increasing and regulation and legalization changing almost daily, the opportunity for a lucrative market is becoming harder and harder to ignore. Some estimates put the hemp market at $10.6 billion by 2025. This is in part due to the demand and in part due to the need for alternatives to things like oil in the food and beverage industry. For example, hempseed oil is shown to be both healthier and more sustainable to grow than other alternatives, such as corn. Hemp also provides are a safer and more natural alternative to prescription medications or chemical-rich topical creams and rubs. CBD tinctures and salves are known to not only reduce pain, inflammation, and anxiety but are a replacement for a potentially addictive option. With pharmaceutical companies coming under attack for pushing often addictive and potentially dangerous drugs onto patients, it’s time to look toward a more natural solution while also following the trail of investments that will soon follow. Even before The Farm Bill was passed, CBD stocks have begun to make investors a profit. There’s no telling what the investment opportunity will be in 2019. Start by familiarizing yourself with CBD and seeing what the hype is all about! 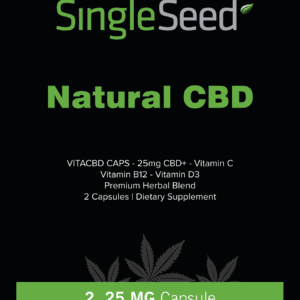 Singleseed sells products that real consumers want, fitting into your active and busy lifestyle with ease. Find products to relieve sore throats, reduce altitude sickness, calm nerves and ease sore muscle aches. Hemp is going nowhere; in fact, it’s just getting started with The Farm Bill and Farm Bill CBD products. It’s time to get informed and explore the possibilities for yourself.